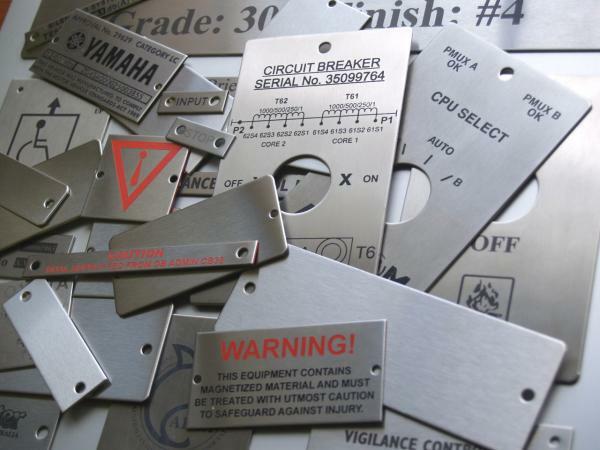 Stainless steel labels are a clean, sharp and durable. Labels can be produced for applications that require a small size with holes or glue on up to a maximum of 300mm x 500mm in size. Our process has been refined so that hundreds of different labels can be produced accurately. Turn around time is typically one to two weeks. However we can produce in a rush we can deliver in as little as 2 to 3 days. They are excellent in extreme environments where corrosion and abrasion can be a problem. It is durable, chemical and scratch resistant and can be used in a wide variety of applications. This makes them an excellent choice for the mining, oil and gas industry. Stainless and Aluminium labels are easy to read with black text that has been bonded to the surface. 304#4 has a light linished finish on one side. 316#4 has a light linished finish on one side.